Learning how to weld, either as a hobby or for work, can be a really rewarding experience. The satisfaction derived from crafting your own work or being able to make an important custom modification is something to laud about and well deserving of full appreciation. However, given the wide range of models in the market, figuring out exactly which welder to go for especially as a novice can be quite daunting. You want to look out for kinds of stuff like how powerful the machine is, the kind of application it’s best for, whether it’s fully kitted or not, and what extra features it comes with. All these can be rocket science for someone who is just starting out. 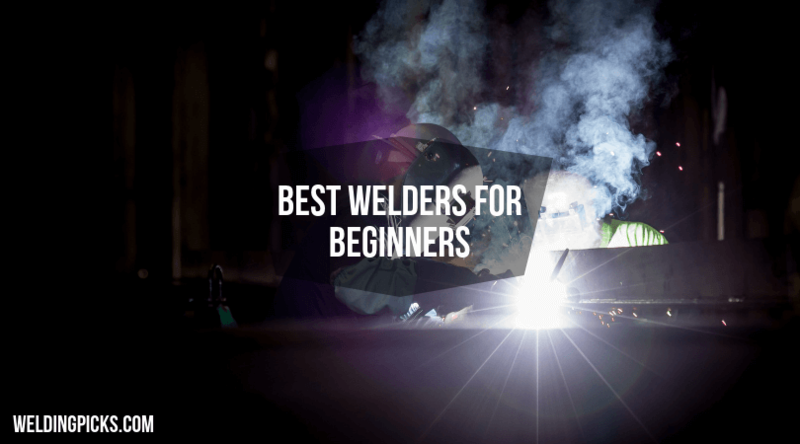 In order to make your search a whole lot easier, we’ve put together a list of the best welder for beginners, with emphasis on what each machine is best for. We hope you will end up picking a welder that will meet your specific need and truly afford you a rewarding past time. 3 What Features To Look For When Buying An Entry Level Welder? 4.1 Which welder can help me produce the strongest welding? 4.2 How much electricity does a welder require to run? 4.3 DC or AC- which one is better? 4.4 When welder produces the finest welds? 4.5 What is the simplest type of welder to use for learning? 4.6 What kind of personal protection do I need for welding? 4.7 Does solid wire work better for MIG welding or is flux-cored preferable? Before we delve into our picks of the best welder for the money, we strongly advise not to focus on price as the major point of separation. However, a cheap welder might not always be good for a beginner. The following list contains the top rated welders in the market to kick-start your journey in welding. We have highlighted their capabilities to enable you to decide which one will best meet your requirements. Without further ado, let’s get started! If you are looking for the perfect beginner arc welder for your stick welding projects, then you should check out the Campbell Hausfeld WS099001AV. This machine runs on standard 115V power (which is the standard household circuit) with a duty cycle of 20% at 50A. According to the product manufacturer, it is capable of welding 18-gauge up to 1/8” material using 1/16” and 5/64” welding rods. Although this unit is very forgiving for novices, it provides an incredible amount of power is perfect for completing small repairs and lessons, as well as hobby welding. This is complemented by its dual heat setting. Another great thing about this welder is that the inbuilt thermal overload protection ensures it doesn’t overheat while a transformer is included to provide easy-starting and a smooth arc. Interestingly, it automatically shuts off once the rated duty cycle is completed. This helps to ensure safety. In addition, this unit is housed with durable metal and is easy and convenient to handle and carry about – thanks to its comfortable fit handle. For its price, it’s the perfect air power expert for your projects. More so, it comes with everything you need to get started right away. Can this weld angle iron? What extra features are included in the package kit? Handheld face shield, rods, hammer and brush. That’s everything you need to start right away. Yes. But you need to buy aluminum specific welding rods. 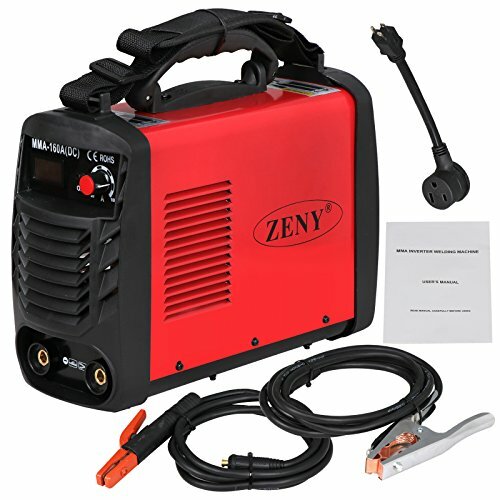 If you are an absolute beginner to welding and you need something that’s very convenient to carry anywhere you need, then you should consider the ZENY Arc Welding Machine. This unit comes with a compact design that makes it highly portable and very easy to translate and store. The comfortable handle also ensures easy carrying so you can painlessly move it to and fro anywhere you need and around your workstation. It has a 60% duty cycle and runs on a dual voltage of 115V and 230V. To ensure consistent welding, a step-down transformer is included with this inverter welder to ensure the smooth transition from AC to DC to produce the proper voltage and current. The best thing about this unit is that its multi-use feature. This means you can use it to metal materials with different thickness including mild steel, stainless steel, aluminum, and others. However, since it’s a DC welder, we do not recommend it for aluminum and it may offer less control over the arc. Does this come with all parts in the package? Yes, it comes with everything you need to start welding. What can of start does this unit have? It has scratch and light start. Does this run the same amperage in 110V AND 220V? No doubt Lincoln is a most revered company in the welding industry with an incredible history that stretches back over a century. They were among the first pioneers of the welding machine, particularly the portable option that is powered by electricity. Interesting, the company has continued to remain relevant in the modern day. 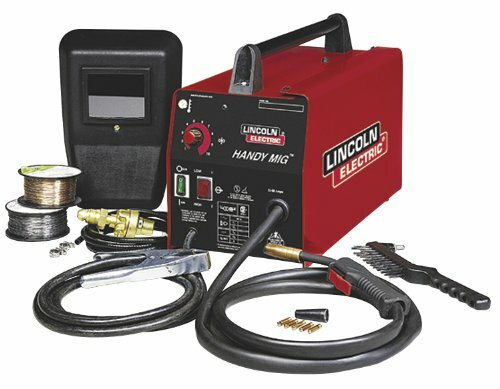 The Lincoln Electric K2185-1 Handy MIG Welder is just one product of their innovative effort and experience and is by far one of the best MIG welders in the market. As an AC powered welder, this unit provides great control for the arc which makes it highly desirable for beginners. This is complemented by its 4 voltage settings which is great for avoiding splatter. You also get a fully adjustable wire feed which gives you more control over the speed of your welding. Although this unit delivers a low output, it can still take on your 1/8 inches mild steel. More so, it doesn’t take long to heat up. Does this unit require shielding gas? Yes, you need to connect to a cylinder of shielding gas. Is this AC or DC output? Can this welder be used without gas? 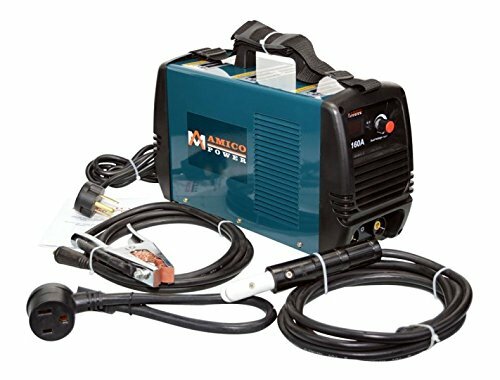 If you are looking for a budget-friendly option to get started on stick welding, then the Amico Power DC Inverter Welder is your brand. It comes with a very portable design that makes it one of the lightest units out there. More so, its specialty in stick welding helps to increase its versatility. Depending on your needs, you can either run this unit on AC or DC electricity. The power output is 160 amps which is quite a lot for a beginner. Thankfully, a control knob is included to the unit to provide infinite control over amperage. This helps to prevent weld splattering. It’s important to note that this unit is exclusively designed, so it might be a little advanced for the absolute beginner who has never handled a welder before. That said, this machine is great for welding mild and stainless steel. Does this work for aluminum? Can this be used on 16/18 gauge steel? Can this weld stainless steel? Although Goplus may not have the same brand prestige like most of the companies on this list, they’ve still managed to provide a solid experience for beginners with their budget-friendly Plasma Cutting feature. This cutter features one of the most advanced inverter technology in the market that greatly improves the cutting quality of your work and offers you a wide range of applications. It is made with high-quality duty iron which makes it highly reliable and long-lasting. It has a compact design which includes a comfortable handle for easy portability. A wire and mask are also provided with the unit to ensure your safety and convenience. As indicated earlier, one of the best things about this unit is its multi-functional use. So it’s not only suitable for the hobbyist and business user but can also be put into professional use. And you can use it process several metal materials. Is there a pilot arc mode on this machine? Do I need to use this with compressed air? While naming a brand “Super Deal” might sound presumptuous, the Black Commercial MIG 130 AC Flux Core Welder is one product that promises to do a good job. For the most part, this MIG welder is an ideal choice for beginners who do not wish to invest a lot of money in purchasing their first welder. Given its relatively low duty cycle of 10% at 105 amp and 35% at 60 amps, this unit is perfect for carrying out simple welding tasks. That said, it can be used to weld mild steel from 18 gauges up 3/16. Can this be powered on household 120V? Can this be used with shielding gas? When it comes to obtaining precision metalwork, even as a beginner, you need a welder with unquestionable quality and performance. There are very few welders that can boost to meet this requirement both for beginners and professional welders. The PRIMEWELD Inverter Plasma Cutter is undeniably one of them. Built to provide you with a lot of flexibility, this unit comes with a lot of features that ensures you obtain a professional finish every time you get on the job. It comes with an air pressure of 65 psi, which makes it possible to accomplish more in less time. And whether you have a 110v or 220V power outlet, this machine will work just fine. This welder is highly portable and works great for copper, steel and steel alloy, giving you a smooth cut. For its price, it’s really a great value. Can this be used to cut titanium? Do I need to buy anything extra to use this machine? Yes, you need a source of compressed air. Does this feature pilot arc? 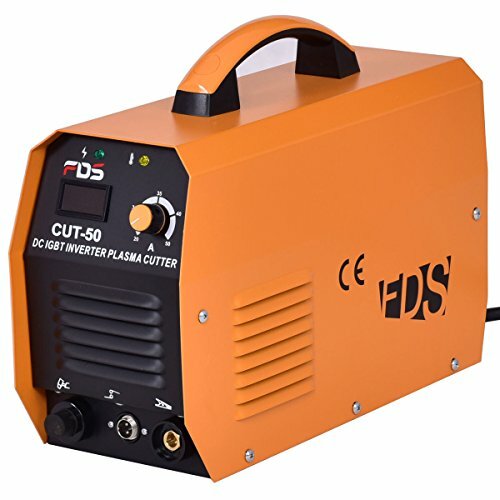 If you’re looking for a beginner welder that has a low price tag but doesn’t compromise on quality and performance, then the Lotos LTP3500D Plasma Cutter is your brand. This beginner-friendly machine is specifically built for home use and works well for a good number of tasks. It has a voltage requirement of 110V and 220V, so should work with all the power sources in your home. It uses a combo of compressed air and an electric arc to quickly cut through various metal materials with great efficiency. These metals include stainless steel, mild steel, copper, aluminum and a bunch of others. However, even though this welder uses a pilot arc touch, you should still expect a slower performance when working with thicker materials. This is usually more evident when you are dealing with a metal like aluminum. This unit weighs just 17.6 pounds and is fitted with a handle at the top. You can walk around with it as you get all your projects completed in no time. More so it is very affordable, which makes it a great take considering all the amazing features it offers. What do I need to start using this unit? You will need to a compressor and pneumatic fittings. Is this pilot or non-pilot arc? This unit features a non-pilot arc. What size of compressor do I need to use this machine? An air compressor that is larger than 4.0 scfrm@75 is highly recommended. When it comes to choosing a welder that can be used for a variety of applications, MIG is a common option. And for the novice or hobbyist, this can mean a lot of fun. If you’re looking for a very affordable beginner MIG welder that offers you just enough power to get started on a simple project, then the XtremepowerUS 100 AMP Welding Machine will make a great bet. 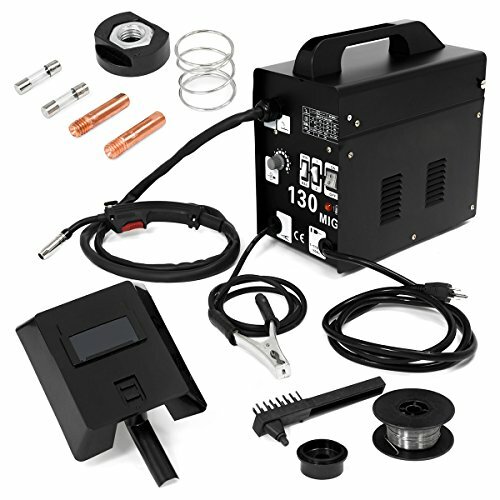 Equipped with a lot of useful accessories, this unit is a favorite for many welding enthusiasts and beginners who wish for a hassle-free experience as they get started in welding. In spite of its “passable” power, it is well-known for producing good quality welds that are neat. Its design and preferred welding technique are what makes it attractive for beginners. Given the sturdy construction of this unit, you can expect it to last you a long time. All this makes this model a truly attractive attraction for newbies who wish to start chunning out standard crafts in no time. No, it uses only flux cored wire. How much power is needed to use the machine? Another weld that’s built with the emphasis on simplicity and portability is the Zeny MIG-130 Gas-Less Flux Core Wire Welder. This welder comes with a dimension that makes it perfect for home use and more portable than many similar models. It is easy to operate and delivers quality work when used for jobs involving stainless steel and aluminum. If you’re an absolute beginner, you might find it a little difficult getting a hang of wire feeding through the device. However, once you are able to get pass this, the process is incredibly easy and the results are noteworthy. There are 4 adjustable heat settings on the machine which allows you to alternate between high and low temperature depending on the welding material. You can also control the wire speed to suit your project through the variable speed settings. In addition, an automatic thermal protection feature is built into the unit to prevent it from overheating just in case you go a little over the recommended temperature range for your work. Can this be powered with 220V? No, it works on the only 110V. Do I need a circuit breaker to use this unit? What Features To Look For When Buying An Entry Level Welder? Getting the best welder that meets the need of any particular project requires experience. But you need to start off somewhere and then grow that experience. Luckily, we are here to fill that gap. As a novice, it’s pretty difficult to identify the most important criteria. Here’s a guide to make the whole buying process a whole lot easier. Although beginner welders are not expected to carry so much power, it’s still important to take the topic into consideration. Regardless of your level, when in the market for a new welder, the issue of power can be related from two angles. The first and probably the most important one has to do with the amount of power the welding machine produces while the second has to do with how the device is powered. The first consideration is necessary because more power would be required by a thicker wire to produce a strong weld, while the second consideration is important because not all current can handle every type of wire. Welding machines are usually powered by either AC or DC current. While DC welders are more commonly used for professional projects due to their ability to handle almost any type of wire, AC welders are generally preferred for beginners since AC current potentially offer better control over the arc. As a beginner, if you end up choosing a MIG welder, you will have to decide on whether to use a shielding gas or not. This can influence the metals you choose for your projects. Most hobbyist projects that involve thicker metals might require you to make use of carbon dioxide in order to allow for better penetration. However, you should expect more splatter. Welding projects that involve short-circuit usually require a mixture of carbon dioxide and argon in the ratio 1:3. Less heat and splatter is created in this case. For aluminum welding, you might need to use pure argon if you want to obtain the best possible results, while stainless steel requires a lot of helium with little carbon dioxide and argon. In other words, your choice of shielding gas highly depends on your project, as well as the type of metal you are using. This ultimately influences your choice of a welder. Another important consideration you need to make when buying a welder is duty cycle. Different welders operate within different temperature limits. The time it takes for a welder to operate before it reaches the temperature limits for a particular output is called the duty cycle of the machine. The duty cycle of a welder is measured in cycles of 10 minutes under steady operation. It is usually expressed in percentage and varies for various outputs. It’s very important to understand the duty cycle of a welder before you can determine if it’s the best option for your needs. For instance, the duty cycle of a certain unit may be given as 40% at an output of 23v and 180amp. Let’s say the operator uses the device to weld for 4 minutes according to the product specification. The remaining 6 minutes is left for the welder to cool down. When purchasing any product, there is nothing more satisfying than having some kind of guarantee for the item in the event failure. This is really important when shopping for welders. Welding machines might not be the most expensive commodities but they definitely cost some money. So it’s important to consider the warranty of a product before making a purchase. Warranty on welders usually range from 1-5 years depending on the brand and cost of the item. Another important consideration you want to make when purchasing a welding machine is the feed speed of the wire. The wire feed speed or WFS is what determines the amount of current that is used in making the weld. The difference between a clean finish and a rough one is greatly influenced by the WFS. A high feed speed can create a wide bead on the weld surface and also cause a lot of splatter. In this case, there’s a strong possibility of burn through occurring since the bead will have very low penetration capacity. In the same manner, a low feed speed can create a narrow bead which will need a lot of grinding and clean up. As such, it’s desirable to have a welder with a controllable feed speed so that the quality of your work will not be compromised. Generally, MIG are the fastest welders. Whether you’re purchasing a welder for the purpose of learning or fun, it’s extremely important to buy a machine that will be very easy to carry about within and outside your workstation. In this case you need to pay attention to the weight of the welder you have in mind. You also want to make sure that the unit has a comfortable handle that affords you an easy grip. A welder that is designed with portability in mind is a lot more convenient to use and power. When it comes to MIG welding, you will be faced with two options – gas and gasless. Gas (or gas shielded) welding usually requires external shielding gas while the gasless option does not. Instead the gasless MIG welder relies on a tubular wire feed that is continuous. Choosing between both types of MIG welders depends entirely on your application or what you aim to accomplish. For instance, since gasless welders don’t need you to use external shielding gas, they are ideal for welding outdoors or when you are on the go. There are also preferable for windy locations since they don’t create porosity in the weld bead like their gas counterparts. However, gasless welders don’t have a fast deposition rate like the units using shielding gas. Other distinctions can be still made. Like we said, it all depends on what you want to accomplish. The wire size and material thickness is another important area you want to look out for before putting out your money for any welder. MIG welders seem to do a better job when it comes to welding aluminum, while stick welders are better suited for cast iron. Regardless of the nature of your project, the best flux cored and stick welders should be able to weld metal materials with at least 1/8 inches. To handle thinner metals, you will need a TIG welder. Which welder can help me produce the strongest welding? It all depends on what you want to accomplish. Some welders usually fare better for some jobs than others. But generally, the stick and arc welders seem to provide the strongest welding. How much electricity does a welder require to run? This really depends on the type of welder and what it is designed for. Some MIG welders may need as much as 220V input or more, while some might need something lower. DC or AC- which one is better? There’s really no direct answer to this question. It all depends on where each one is applied. But generally, DC welders provider smoother welding while AC welders tend to be much easier to handle, especially for beginners. When welder produces the finest welds? When it comes to aesthetics, the TIG welder seems to do a better job than other types of welder. Their weld finish is usually more beautiful and stronger than others. What is the simplest type of welder to use for learning? As earlier indicated, the MIG welder is a great tool for getting started in welding. Besides their simplicity, they also afford you enough versatility to become skillful in a short time. What kind of personal protection do I need for welding? There are basically two kinds of personal protection you need depending on the particular welding task you are engaged in. These include eye and face protection, and protective clothing. Sometimes you may also need to wear helmet and hand shield depending the project and the safety requirements. Does solid wire work better for MIG welding or is flux-cored preferable? For the most part, many people love to go with flux-cored MIG welding due to the simplicity it offers, however, each of this method has its own pros and cons. At this point, we are sure you’ve gotten everything you need to know about choosing the best beginner welder, either for learning or fun. We hope you choose one of the brands above, as that’s the only way not to end up disappointed. Whatever you do, make sure you don’t go empty handed or settle for welders that are overpriced. The list above represents some of the best you can get for the money.